9 Reasons Our Woven Throws, Totes and Pillows Are Better—Plus Easiest To Order: 1) They’re Jacquard WOVEN (never printed!) of 100% cotton dyed yarn; 2) Will not fade even after repeated washing (with only minor fading possible if left in sunlight); 3) 4 throw sizes (from 40”x54” to 60”x80”), 2 pillow sizes (17”x17” and 27”x27”), 3 wall hanging sizes and 3 bag styles; 4) Prices starting at just $70; 5) Simply upload or email your photos to us (that’s ALL you need do!) and we’ll handle all image cropping/layout/design (plus you can request a PDF for review) and we’ll also automatically sharpen, color adjust, etc., your pictures; 6) Or send us your photos before ordering and we’ll gladly pre-check image quality, etc. ; 7) Either way, we’ll ALWAYS let you know before printing if your photos aren't adequate; 8) Plus, for an additional fee (starting at just $10), we can create a custom design or collage; and 9) We can similarly add text, logos, graphics or even retouch your images. What You Need To Know: Kindly note our products are genuinely woven and NOT printed--meaning the threads are colored BEFORE being woven (believe it or not!) using the latest technology so your photo is NOT merely printed on the fabric afterwards! Our Throws are 100% cotton Jacquard woven, hand finished, fringed on all sides, machine washable, extremely durable and made in the U.S.A. And while we now offer four sizes, our standard 71"x53" throw remains the most popular at just $90. We also offer three kinds of woven bags: all are 100% cotton Jacquard woven, fully black lined, hand finished, extremely durable and made in the U.S.A,, with our popular 17"x17" Tote featuring black straps, our 16"x14" Eco Tote a bottom shelf, and our 16"x12" Purse a snap and black plastic handles. We've also added a new 27"x27" jumbo Pillow (regular 17"x17") and offer three sizes of woven Wall Hangings. When choosing a photo, kindly keep in mind: 1) high contrast images (with a clear distinction between lights and darks) work best; 2) subjects should be large (at least 60-80% of image); 3) realistic face tones and other colors are important; and 4) picture focus can be crucial. While its craft-oriented look and feel may take precedence over photo resolution, you'll still need to provide a reasonably sized digital image due to the dimensions of the finished product. If you have ANY questions about this, please do not hesitate to Contact Us and we'll even gladly review your photo before you order. Also, feel free to add a name or short phrase for $10 per line or include a logo or other graphic for $10 each. And as you'll see elsewhere on this page, our ability to enhance or otherwise manipulate your images goes far beyond the aforementioned extras. So feel free to Contact Us about any special needs you may have. What We'd Also Like You To Know: "For awhile I had QUITE a parade of horse people through my house while she showed them off!!!!" a Massachusetts mom exclaimed, referring to the Woven Throw and Keepsake Box she ordered for her daughter. "All in all, we are COMPLETELY satisfied with everything--from the quick responses to my questions to the workmanship (of the products) to the OUTSTANDING quick delivery!!!!" "My daughter absolutely loves it," a Maryland mom similarly offered, talking about the Throw she ordered last April as a high school graduation gift for her daughter. "What a great gift to take to college with her:-)" she said, more recently adding: "We were just visiting her at college last weekend and it was front and center in her room!!" "Beautiful" is the way another Massachusetts mom described the Throw we made for her daughter as a 2011 Christmas gift: "I sent a very complimentary email to ABC news about your company," she added, explaining the network was doing a series on gift products made in America at the time and looking for story ideas. "If everyone bought one Christmas gift that was made in America it would create over 200,000 new jobs!" 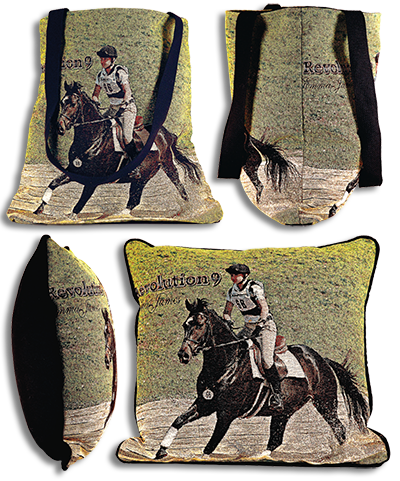 Meantime, a Virginia husband who ordered a Woven Tote for his wife's birthday, with her horse's name added "in script, if possible", later told us: "She loves it!" And a Maryland attorney, talking about a birthday gift for his spouse, commented: "The throw is beautiful. My wife was surprised and liked it very much." On the other hand, it was a little more difficult to satisfy one New Jersey mom. "Everything was great! She loved them!" the mother said afterwards of her daughter's reaction, but when we were initially prepared to proceed with a Throw and Pillow the mother still had one more request: "Please confirm you can take the people out of the background (in the photo)." And so we did, along with sharpening and otherwise improving the overall tone of the shot: for a before and after look at the picture, please click here. Or for a few more examples, click here. Not sure your photo's good enough? Trying to decide between several pics? Or need some other assistance? Go to our Custom Quote page to upload any images you'd like us to review or to have questions answered before placing your order. And for more product info, call us at 1-877-N1-Horse (1-877-614-6773) or fill out our Contact Us form and we'll get back to you as soon as possible.